It's been called the "scariest game in years". It's at the top of iOS and Android app stores, it has torn up the Steam charts on PC. It has racked up millions and millions of views (and screams) on YouTube. It has hundreds of earnest fan games, and dozens of rabid fan theories. The Five Nights at Freddy's hype train is incredible. And yet, every time we write about the game here at Kotaku, there are a number of people don't seem to get the Five Nights at Freddy's phenomenon. Since the release of the third Five Night's at Freddy's game seems imminent, now seems like the perfect time to break down what Five Nights at Freddy's is all about, and why people can't seem to stop talking about it. What Is Five Nights at Freddy's? 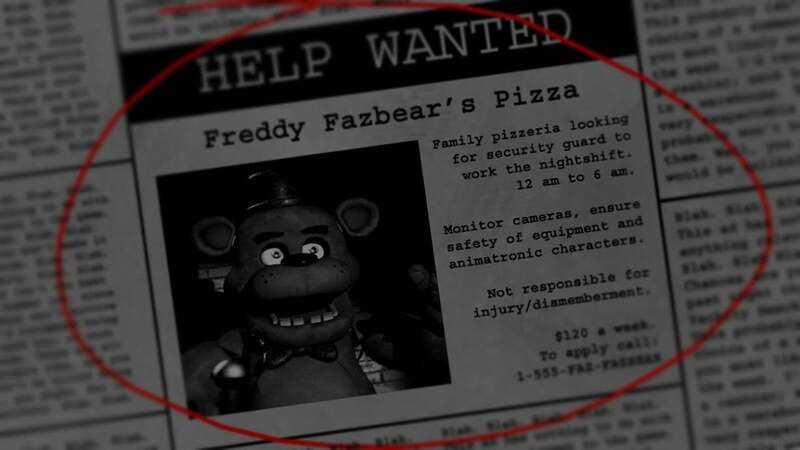 The Five Nights at Freddy's series puts you in the role of a security guard that keeps watch at night at a local pizza place. Your goal is to stay alive until the morning, and ultimately to survive five nights in a row at the pizza establishment. Hence the name. The franchise originally made its debut on a distribution service called Desura last year, where it was very popular. Months later, the first game got voted through Steam Greenlight. This game blew up, and these days creator Scott Cawthon says he gets hundreds of emails every hour, and he has to constantly remind people of impersonators online. A few months after the release of the first game, the second game launched on Steam, too. And now we're about to get a third one! All within the span of like a year. Definitely. But, Five Nights games are small indie games: they don't take as long to make as other games on Steam. That, and, it's undeniable that there's a huge demand for the series. Look at the ridiculous number of fan games. Or how every single YouTuber you can think of, from PewdiePie to Markiplier, has probably made a Let's Play of both the games. Or look at how well the game is selling — it's been on the iOS charts for weeks. It's easy to think that the pace at which these games are releasing is just a cash-in, but that would ignore the fact that people are hungry for more. OK… so, hold up. Why does a pizza place need a security guard? Because pizza is life. OK, actually, it's more that the pizza places you oversee are special. Think of them like a messed-up version of Chuck E. Cheese: the establishments are used for kids' entertainment, and they come stocked with animatronic animals. "Freddy" is one one of those animatronics, and he's a bear. A very dangerous bear. There are other animatronics too, which include a chicken, a fox, and a bunny, among other ones. Instead of shutting down the animatronics at night, the people in charge allow them to roam around the restaurant. According to your employers, the animatronics need to keep moving in order to work properly. Which is bad news for you. That's strange, but not very scary. I heard these games were supposed to be scary. What, you don't think the idea of weird animal robots roaming around you in the dark is at all frightening? You've never once thought that Chuck E. Cheese's mascots look freaky, and pondered how children could find those costumes charming? Well, ok. It's not just the uncanny, early 2000s-era graphics that that make Five Nights vaguely unsettling. Mostly, it's in the design. The way the games play out. OK. How do the games play out? Since the animatronics walk around, sometimes they will wander up to your office. When they see you, they think you're supposed to be in an animatronic, too. So they will jump on you seemingly out of nowhere, and try to stuff you into an empty animatronic suit. If they succeed, it's game over: they have killed you. Wait, they want to stuff you into a suit? That's weird. This game sounds weird. So, the suits have something called "endoskeletons", which are basically the robot's version of bones. Like, all the metal and whatever making up the inside of a suit. When animatronics see you they think you're an endoskeleton and they're like, oh crap, where is the rest of the suit? We better fix it! And so they jump on you. But yeah… it's weird. So, it's just bunch of jump scares? While there are jump scares in Five Nights games, those only happen if you play the game inefficiently. In a perfect game of Five Nights, you never encounter a jump scare at all. 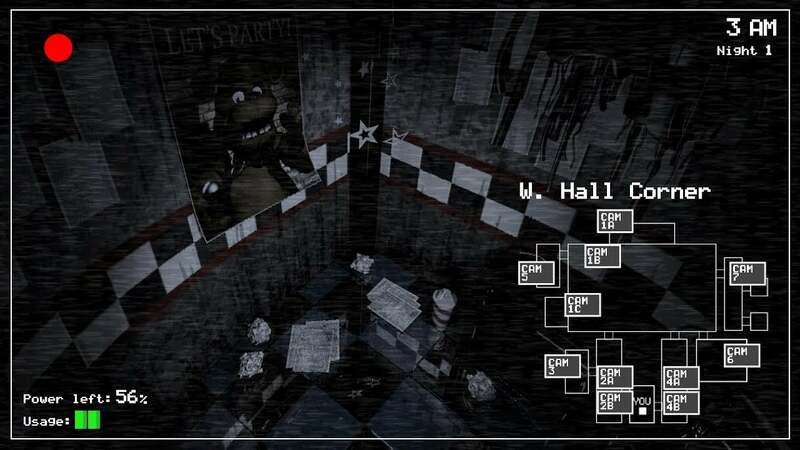 Of course, there's a running joke that most people don't play beyond five minutes, because they get too scared, so the average person's experience of Five Nights is likely just jump scares, yes. But there is more! What else is there to the game, then? On the bottom right, there are a bunch of numbered rectangles. These are cameras. You can click on any of the squares, and you'll be able to monitor its respective room. Some rooms have video, but in others, you'll only be able to hear audio. As unnerving as that can be, things don't get Real until animatronics actually get close to your office. Sometimes, you can hear the animatronics crawling toward you, even if you can't actually see them. How you deal with the animatronics then depends on the game you're playing. 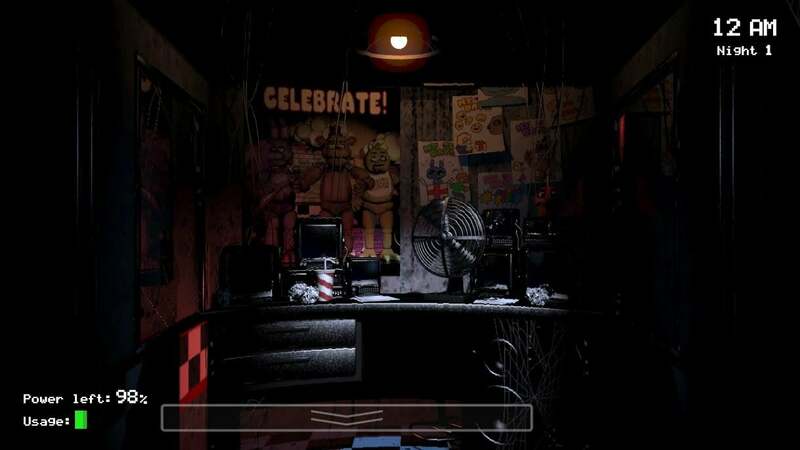 In the first game, you have a flashlight, which helps you keep track of animatronics around you. You can also close the doors near you, so the animatronics can't get in. However, doing either of these consumes your limited power, and if you run out of power, you're left in the dark. Your flashlight dies, and your cameras stop working. The doors refuse to close. Basically, you're left vulnerable. You can't play too defensively without endangering yourself, which keeps things interesting. How is the second game different? In the second game, the core mechanic is still the same: you monitor cameras, and you try your best to stop animatronics from killing you. The best way of doing that is to be mindful of the patterns that the animatronics follow. The second game introduces some twists, though. FNAF 2 has no doors, which means that you're more open to attack. There's also a special animatronic that is only kept at bay if it hears commotion. Under normal circumstances, you're the biggest source of sound at night in the facility, so the animatronic is predisposed to want to come toward you (and in doing so, stuff you in a suit). The game gives you a little music box, and the longer you click it, the more you wind it up, the more music it plays, and the longer you can keep the special animatronic busy. So in addition to checking all the different cameras to make sure no animatronic is getting too close, you have to constantly go back to a specific camera with a music box and make sure that's wound up. The micromanaging is nerve-wracking. There's one more thing, too. Remember how you don't have doors? That means animatronics can get into your office easily. But, instead of giving you a way to fight against them, FNAF 2 gives you a bear mask that you can wear, and this fools animatronics into thinking you're one of them. So whenever an animatronic gets near you, you stop whatever you're doing, and you put on a mask and you stay put until the animatronic decides to leave. The only thing you can do is to listen to the sound of your breathing, and hope that the animatronic goes away. All of these elements work together to make the game really stressful. People like to watch other people stream this game, right? Is it really fun to watch? Sort of. Honestly, the gameplay doesn't lend itself so well to video, or streaming: you're mostly changing the scenery a bit, as you change between camera views. The big hook isn't to watch others play skilfully, or to catch interesting action going on in a Five Nights video. People like to watch because inevitably, the person playing the game will mess up, and that leads to a jump scare. People like to watch the game for the freakouts, the screams, the reactions. There's something about watching other people get scared that feels gratifying and entertaining for folks. If you've noticed, many of the big viral games in recent years have mostly been horror games: Slender, P.T., Amnesia, and now, Five Nights. All of these games are great to play, for sure. But the way they spread has a lot to do with the culture of horror. Think about the scary myths we all hear when we're kids: how, for example, if you say "bloody mary" three times in front of a bathroom mirror, something will appear, or how, if you turn on your TV at midnight, you'll see the face of your destined lover. Inevitably, curiosity sets in. People will test rumours out. They want to see if the things people whisper about are true. They want to see if the thing in question will scare them, too. It's almost like a challenge. It's the same thing with games like Five Nights. People hear about how scary the games are, and they can't help but want to see what the fuss is about. Creepypasta spreads much in the same way. What makes things like Five Nights spread is that, even if you're too timid to play the games yourself, you can watch someone else brave it for you on YouTube, and you don't even have to spend any money. And then, if you decide to play the games yourself, you can get both of them for about $US15 bucks. Once you start playing, it's hard not to get absorbed in the story, too. Yeah. 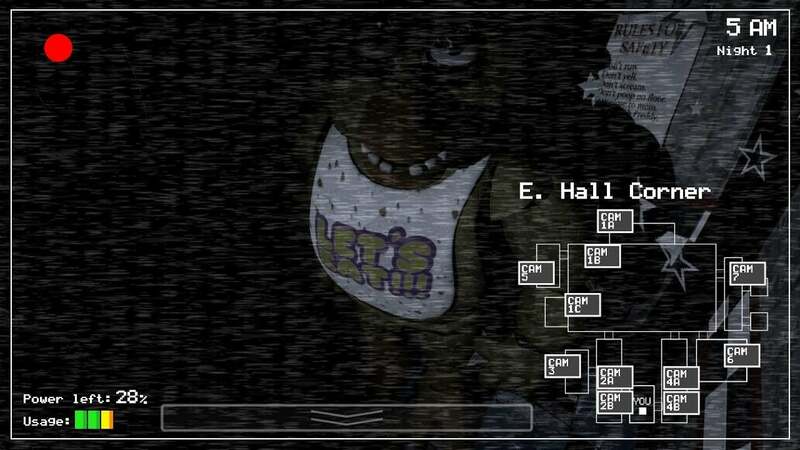 I don't want to spoil it, but basically, every night that you survive, the game gives you a few more nuggets about what is actually going on in the world of Five Nights at Freddy's. You hear, for example, that at one point, one of the animatronics bit off someone's frontal lobe, and other dangerous incidents involving the animatronics. There are also subtle clues about when the games take place, or what the story behind each animatronic is. People have taken to dissecting the hell out of the game, and it's resulted in many awesome, if far-fetched fan theories about who the real villain in the game is, or what the game is actually based on. My favourite theory suggests that the games are based on a real-life murdering spree at Chuck-E-Cheese, but the theory most people have heard of is that the second game is actually a prequel. Some would even say this aspect of Five Nights at Freddy's culture has gotten out of hand. To wit, one YouTuber that I'm subscribed to has made at least a dozen videos that take a closer look at the recent Five Nights at Freddy's 3 teaser, and there are already a handful of theories about the game itself. And it isn't even out yet! Hopeful YouTubers feed off the Five Nights hype, which keeps the game's interest alive in-between releases. Couple this with the genuinely cool, new things that the series does, it's no surprise that the games have found such success. People like playing Five Nights. They like talking about Five Nights. And they like watching Five Nights. People even like copying Five Nights: since the game hinges on a simple (albeit brilliant) concept, fans who are more technically savvy can easily make clones. These clones also get played and blown up by YouTubers, and in doing so, contribute to the ongoing sensation that is Five Nights at Freddy's. All the same, it feels like this game came out of nowhere. It might seem that way, but the developer, Scott Cawthon, has been making games for a long time. According to an interview with Clickteam, Cawthon has been making games ever since he was a teenager, though he doesn't really consider himself a gamer outside of a few favourites, like Ocarina of Time and Super Metroid. Cawthon went to school for animation in 1996, which might explain why the graphics of his games look like bizarro Pixar animations. On his YouTube channel, you can find videos from up to 8 years ago, all of which showcase different projects he's worked on over the years. One of his earlier bigger games is called "The Pilgrim's Progress," and it's is based on the well-known Christian novel of the same name. It plays much like a JRPG, except your stats include things like "Faith," "Zeal," and "Prayer," and you attack enemies with things like "Truth," "Promise," and "Grace." A later project, called "The Desolate Hope," got praise (and criticism) for its pro-life message — the premise is that you play as a coffeepot that tries to save the life of a discarded embryo. People who follow geeky religious websites very well may have seen Scott's work in the past, before he was famous. Five Nights doesn't seem very religious. It's not, right? My relationship with God through the years has been absolutely essential, and only now can I look back and see what He has done. For about twelve years I dedicated my free time to creating Christian movies and later Christian video games. It didn't go well, but I had faith that God wanted me to create those things anyway. Despite good reviews, my Christian projects were all financial failures. I came to a point where I was very disillusioned and frustrated with God…actually it was more like a broken heart. I felt like I'd squandered so many years of my life, years that could have been spent going back to college but were instead spent working on Christian projects that went nowhere. I came to the conclusion that I could not have failed so miserably unless God himself had been holding me down. Either God didn't exist, or God hated me. I didn't know which was worse. I decided to change careers, at times pursuing web design, then computer programming, even truck driving, but I always felt drawn back to games. A pivotal moment came for me when my life insurance policy was cancelled. The insurance company had caught wind that I'd mentioned suicidal thoughts to my doctor. It was at that point I realised that not only did my life have no value but now even my death had no value. I went before God again, and it was the first time that I truly went before him with nothing. I had nothing to offer him. I told him to use me somehow. Although at that moment I had no idea what he could possibly use me for. I felt drawn back to games again, but not Christian games anymore. It's not that I wanted to leave the Christian market, I just didn't feel "led" to make another Christian game. Instead, the events of my life led me to a great idea for a horror game- Five Nights at Freddy's. But, that's not the only reason Five Nights came to be. The other key thing that led Cawthon to making Five Nights was the reception of a different game, Chipper & Sons Lumber Co, an adventure game where you play as a beaver that chops down trees and builds stuff. Beavers. Cawthon submitted the game to Steam Greenlight, and it was eviscerated by critics like Jim Sterling, who called the game unintentionally "terrifying," and that the characters — which were meant to look cute — seemed "soulless." "People said that the main character looked like a scary animatronic animal," Scott Cawthon said in an interview with IGM. 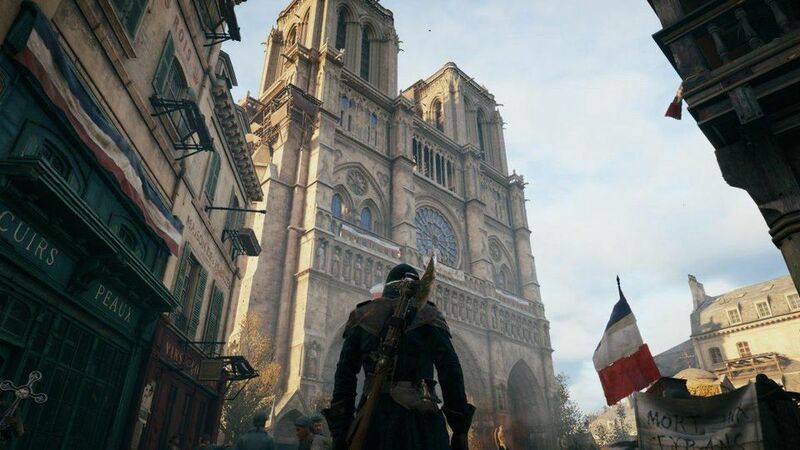 "I was heartbroken and was ready to give up on game-making. Then one night something just snapped in me, and I thought to myself- I bet I can make something a lot scarier than that." And so, Five Nights at Freddy's was born. It was the product of heartbreak, soul-searching, great design, and luck. Kind of amazing, no? That's a pretty great story. Definitely more interesting than your average game creation story, yeah! What game should I start out with? Given how short and cheap they are, I suggest trying both. While FNAF 2 is the more complex game, playing both lets you get invested in the story, and that's one of Five Night's biggest draws. If you're short on time, though, just try the second one. You'll get the signature Five Nights experience, but improved from the first game. Are any of the fan games good? Typically, the fan games are more of the same, but with different themes.But, if you're hooked in Five Nights already, that might not be such a bad thing. There's a take that uses Nintendo characters called Five Nights at Wario's. A different fan game uses Disney characters, and that one is called Five Nights at Treasure Island. There's a bizarre JRPG take on the game, and it pokes fun at the characters — it's good if you're looking for a laugh. If you want to make things more intense, though, you should probably check out the multiplayer version of the first game: it lets people control the animatronics, and they have to try their best to kill the players controlling the security guard. What if I wanted to watch the games instead? The easiest way would be YouTube. You can find the most popular Let's Plays of Five Nights here. Fair warning: you're going to hear a lot of screams. So, these games seem very "now." Surely they're going to burn out. Can they really stay this popular? I get your scepticism, especially given how fast new games are coming out. Even the people who feature the games heavily on YouTube, like Pewdiepie, criticise the phenomenon around the game…but they will still make videos about it. If we look at previous games that enjoyed virality, like Slenderman, it seems like they all but disappeared after a few months of hype. I get the sense that people are starting to get fatigued of Five Nights. 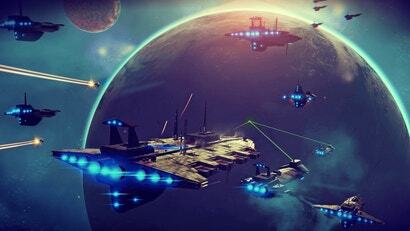 At some point, the games won't be as popular as they are now — these things do go in cycles, after all. For now, the third game looks promising. It takes place thirty years in the future, and it features one frankenstein animatronic put together from the parts of other animatronics. That's a neat enough premise that I'm willing to give it a shot, at least. OK, well, I think I understand these games better than I did. Thanks! I thought they were popular because they were an easy million hits video. I enjoyed watching youtubers play it, more than playing the game itself. Same with Happy Wheels. Plenty of people like it for its gameplay, but I'd argue the bulk of its popularity is from LPs. Some people really are about the views and playing it up. There's a rather infamous recording of a guy freaking out over Silent Hill: Downpour, in a situation that wasn't scary at all. At least its not another Slender/Amnesia clone. That's what I always say. I love scary games. hate playing them though. But 'Five Night at Freddys' I didnt find scary at all. So he didn't do so well making Christian video games, and started making non-Christian games which which were great. Then credits God with helping him to be successful by not making Christian games? Interesting logic. 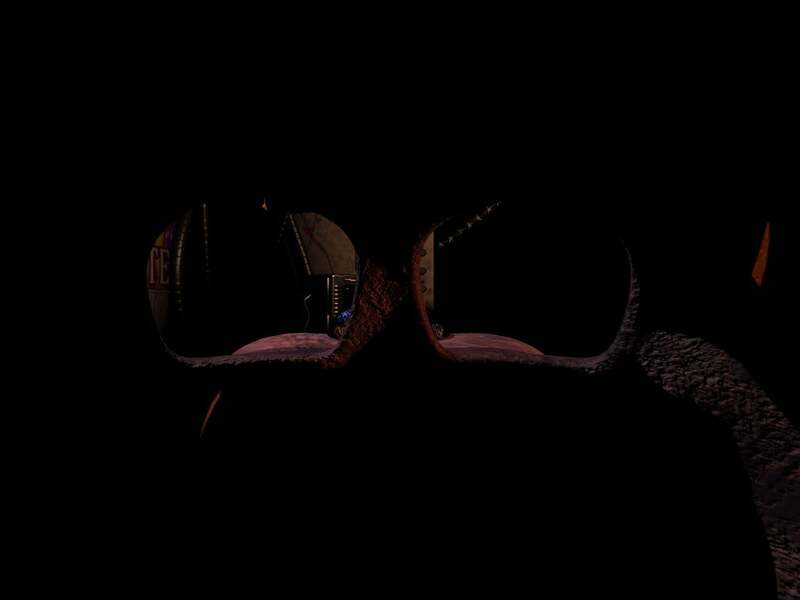 Five nights at Freddy's 72 is coming out in July of 2015. Doesn't really look very scary to me....and damn if that ain't the most stupid convoluted idea for a premise. Animatronics that are alive need a guy to watch them at night so they don't do ? but they are confused and want to put him in an exoskeleton because ? which kills him....uh yeah, great idea. I think it's called 'suspension of disbelief'. Yep it's a stupid premise but I can see why it's successful. One, many people are scared of the idea of something hunting them slowly and inevitably, like in a nightmare. Two, something that kids are scared of is the dark, and probably related to this, their own toys in the dark. The concept seems to blend both of these things. That's very true. Movies work on the basis of "suspension of disbelief" , which leads to horror movies, which leads to horror games. Well, this is very in-depth. A very interesting article! Still IMO, FNAF is popular because pewd played it. But then, i don't watch pewd, or play FNAF, so... do what you will with that. People love the games because they're good, simple and fun. The horror aspect makes your palms sweat a little, just like a frantic puzzle game or an RPG boss battle. AS a grandmother of the seven yr old boy watching these utube videos of Five nights at Freddies, I find it so boring and just--- stupid! I cannot even figure out what he sees in it and why he seems fascinated with this cartoonish thing. It is not scary. It is dumb. I think he is wasting his brain power even watching this nonsense stuff.